You probably see a lot of articles and blog posts about online marketing. And not just online marketing, but the nitty gritty details of executing on various techniques and approaches to online marketing. These are good and necessary discussions, but for someone who is just starting off on the journey of online marketing, it can be a bit overwhelming. So, if you’re new to online marketing, it’s ok – just breathe. 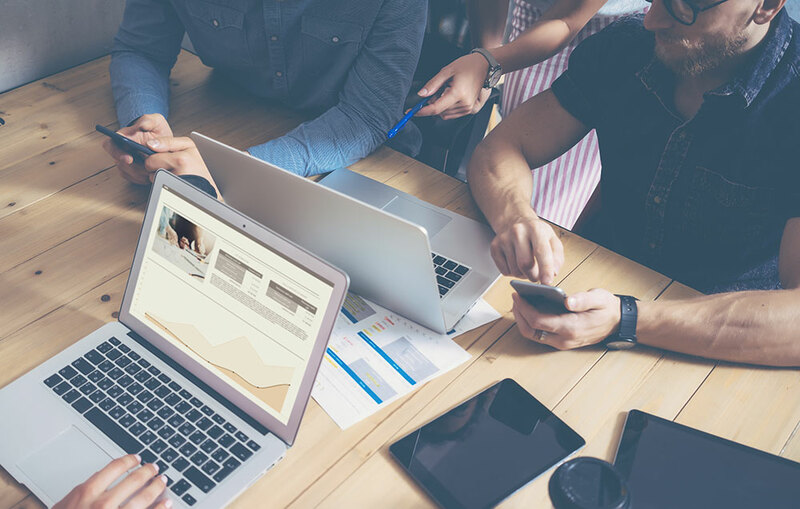 Let’s go over the basic steps you need to take to get your business up and running on the web before you dive headfirst into search engine optimization, email automation or social media marketing. Big things often have small beginnings. Don’t let the daunting task of getting a full online marketing system in place stop you from taking these five steps to get started in the online world. The biggest, baddest, and most successfully websites on the internet started in the same place that you are right now. So with that in mind, let’s get your business online. The first step is to research and purchase your domain name with a registrar like GoDaddy. For example, a business named New Company would look to purchase newcompany.com. There are two parts that comprise a domain name: the domain and the extension. Which extension you choose will have a good deal to do with what extension is right for your website. If you’re operating a business, then .com is the obvious choice. For clubs or organizations, including non-profits, a .org domain is often the most appropriate. Often, the most obvious .com or .org domains are no longer available, but you can get around that in a few creative ways. Try adding a hyphen where possible. So newcompany.com becomes new-company.com. You may also try adding a descriptive word. Instead of kensburgers.com, you find that kensburgerkitchen.com is available. There are many other extensions that have recently become available if you want to stand out, such as .ninja and .rocks. Sites that do domain name searches usually also do the registration, so compare prices and grab your online address. Step two is quite possibly the most difficult. Conceptualize and build out your website. We can tell you; this is a major stumbling block for a lot of businesses. Don’t think of your website as a work of art any more than you would think of a company brochure as a work of art. Graphically, it should be appealing but focus on providing the information that potential customers will be looking for in a way that they can find it. Brand your website properly – Your website, like any piece of collateral, is a visual representation of your company. Ensure that it is an accurate one. Keep your content clear and concise – Avoid flowery language, ambiguous language, and “marketing speak” on your website. Clear and concise will always beat out clever. Give visitors something – How often do you visit websites that offer you nothing? If your business’ website doesn’t offer fresh content, tips, advice, or products why would anyone come back? People rarely buy or convert on their first visit to a site. Repeat visits will be the lifeblood of your success, give people a reason to come back. Make it obvious what you want users to do, and give them a good reason to do it – If you want them to give you contact information, give them a clear form and a reason to fill it out. Don’t be annoying – We’ve all been to a website with flashing graphics, or music that plays in the background. Don’t be that company. Make sure that your new website is mobile friendly – As of last year, more traffic on the internet comes from mobile phones than it does from computers. Finally, how much should your website cost? The bottom line is, it could be as cheap as free or as expensive as you want it to be. It will all depend on what you are building. Just keep in mind that a free website isn’t free. The true cost of a free website comes in the form of the time you spend away from your business to build and maintain your website. Ok, you’ve bought your domain name, and you’ve built a great website, now what? Well, people won’t just show up. The field of dreams approach (“if you build it, they will come”) doesn’t work for websites. 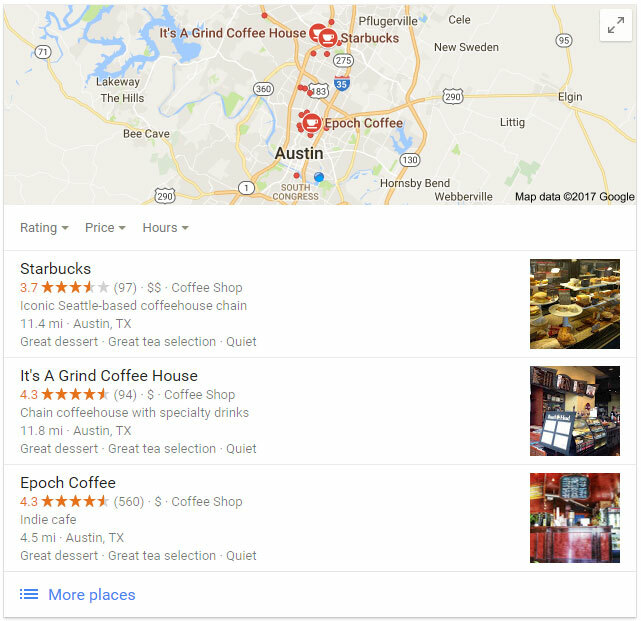 People are naturally drawn to the top results for most searches, so you will need help getting your site to show up higher in search results as well as other Houston digital marketing approaches to improve your visibility. Submitting to local directories, however, is the best place to start and will give you the quickest results, but don’t expect too much too fast. Social media networks are where people spend their time. The average person spends just under 2 hours a day on social media. Your audience is on social media, so it’s not a logical leap that you should go looking for them there. Always be on brand – Decide on a look and feel for your profiles that are consistent with your brand and stick to it. Always be on story – Decide on a story for your profile to tell and use high-quality images and creatives to tell your story. Always be on time – Post consistently, at least every couple of days. Nothing is less engaging than a half filled, abandoned social profile. 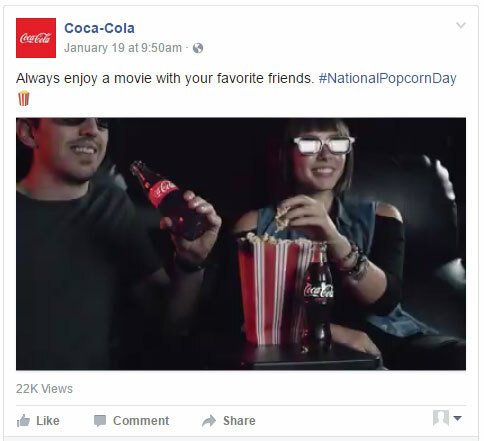 Take this Facebook post from Coca-Cola. It’s on brand (everything Coke does is brand focused), it tells the story that coke is always pushing (that they’re a part of the best times in your life), and it’s timely (aimed at national popcorn day). People tend to think of their favorite brands like friends. People look for honesty, value, and reciprocity in the brands they love, and those arise from great content. Lock in a source for ongoing content for your site’s blog, your social media account and gated materials that you can use to attract new leads. You may find that it’s helpful to develop buyer personas for your business. Buyer personas are fictional customers that represent the different types of individuals who are likely to become your customers. Creating buyer personas allows you to tailor your content to the people most likely to become your customers. You’ve purchased a domain name, built a website, submitted to all of your local directories, and now you’re publishing content on your website and social media… don’t stop. That is a mistake. You’ve only just begun. Successful websites are never complete; they are living things that continue to grow. Creating new content to attract new people and keep existing people engaged is the hallmark of good online marketing. It may look like hard work now, but so did inventory management and business accounting at one point. Now, those are essential business functions, and so you’ll soon see that operating a website falls in the same category. Trust business partners to help you through the rough patches and start reaping the benefits from opening your business to billions of online prospects.